Our newest addition to the fine drinking glasses, tankards and growlers is our Viking Drinking Horn. Crafted from bovine horn in the traditional viking horn style, they are smooth and polished. 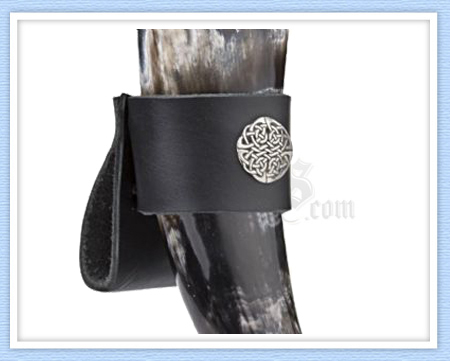 You can also select a drinking horn with metal banding for a great stylish look. Like to watch the tv hit series, "Game of Thrones" with friends? Get Game of Thrones / Viking Drinking Horns for all your friends and party in style while watching tv! Love football? These horns are great for drinking your favorite brew during a sporting event. 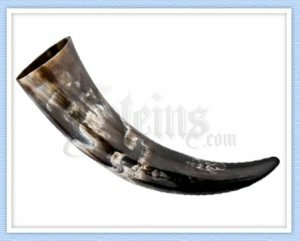 These drinking horns really make a statement, so be sure to bring it to your next party or event and party in style! These make great gifts too, especially for those who love renaissance fairs or like to collect medieval items. Or fans of Game of Thrones! Prefer to drink your brew more slowly? 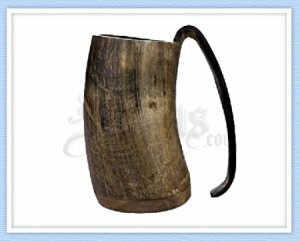 We also offer viking tankards that are carved from cow horn and have a wooden bottom. Like the look of pewter? 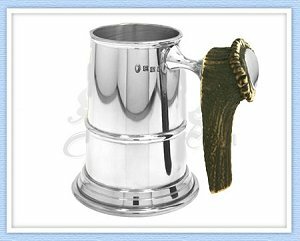 We've got the perfect tankard for you - a finely crafted pewter tankard with a horn handle. Get it personalized with an engraved message or someone's name. Each drinking horn is unique, like the horn it's crafted from. Differences in color, shape & size of the horn used to sculpt the horn affect the look of the final product. Another option for your drinking horns is a leather horn holder. These are perfect for tailgate parties and renaissance fairs. Emebellished with celtic knots or swirls, these leather horn holders are the perfect choice to easily carry your drinking horn with you. Caring for your drinking horn or tankard is easy. Simply give them the same care as a ceramic mug. Wash after use with warm soapy water and never put them in the dishwasher, where they could be damaged from other items. When not using your drinking horn, store it in a dry place...but not too far out of reach, because once you're used it, you're going to want to use it all the time.